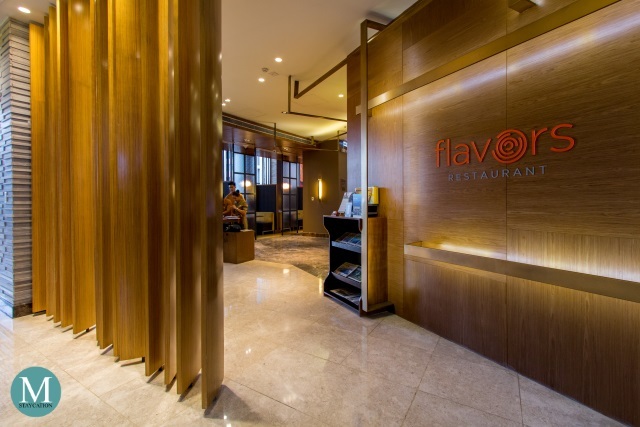 Flavors Restaurant, the all-day dining restaurant of Holiday Inn & Suites Makati (Philippines), will be including a Poke Bowl Station in its lunch and dinner buffet spread on all Fridays of Lent, starting March 3 until April 14, 2017. Poké /poh-kay/ is a Hawaiian delicacy which is basically a salad dish consisting of cubed raw fish marinated in soy sauce and sesame oil, and mixed with sesame seeds, dried seaweeds and chopped scallions. It is traditionally served as an appetizer but can also be eaten as a meal when served with a bowl of rice or fresh vegetable salads. 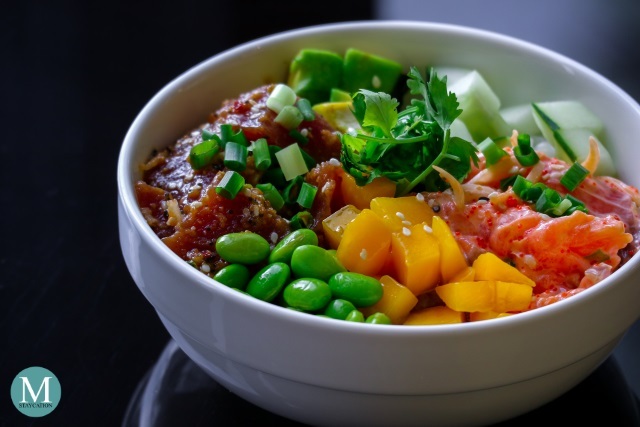 Poke Bowl became a craze in California back in 2014. This food trend finally reached the shores of the Philippines in mid-2016. 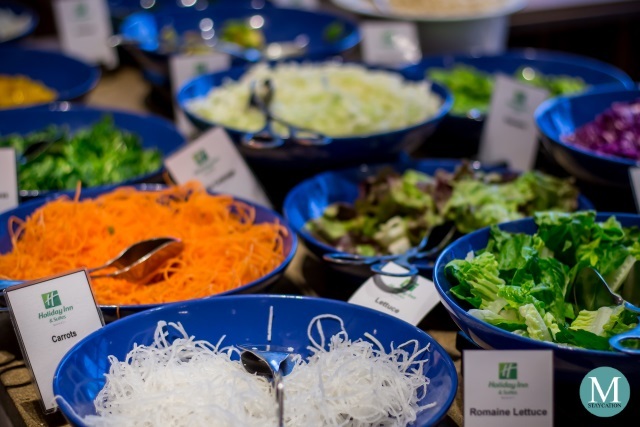 Since then, different restaurants have already come up with their own creative versions of this healthy Hawaiian dish. 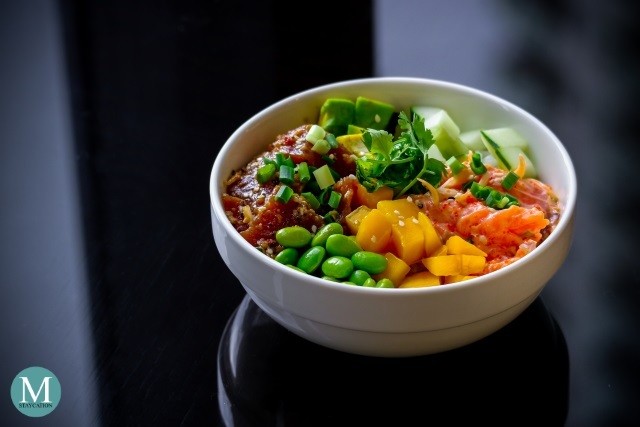 The (do-it-yourself) DIY Poke Bowl is a fun way to enjoy this dish where you can be creative and imaginative in mixing the ingredients of your poke bowl, and here at Flavors Restaurant, you can have unlimited servings of your DIY Poke Bowl. 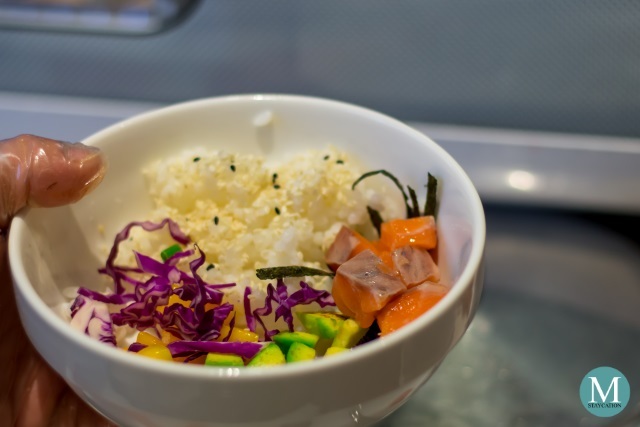 The Poke Bowl Station at Flavors Restaurant includes freshly sliced sashimi-grade tuna and salmon, a wide variety of fresh vegetables and fruits, steamed white and brown rice, pre-mixed sauces, as well as garnishing. 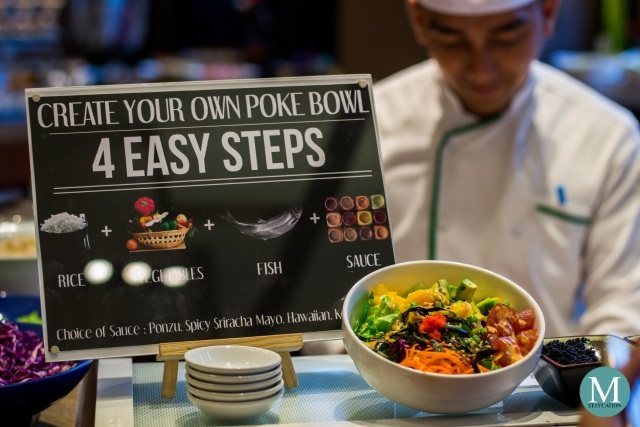 The nice thing about the Poke Bowl Station is that they made it very simple for guests to assemble their own poke bowl. They already pre-mixed sauces so you don't need to make the sauces form scratch. 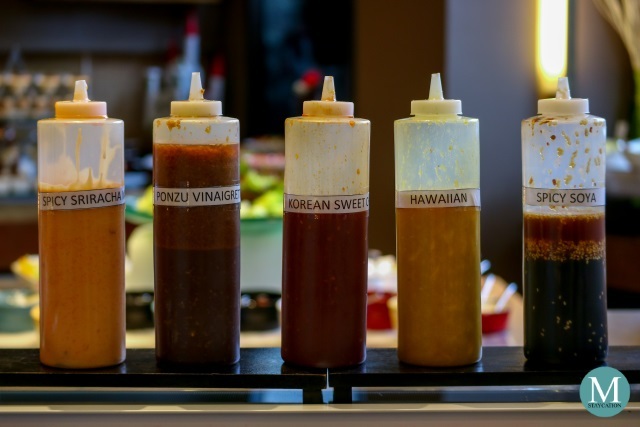 Choices include Spicy Sriracha Mayonnaise, Ponzu Vinaigrette, Korean Sweetchili, Hawaiian, and Spicy Soya. 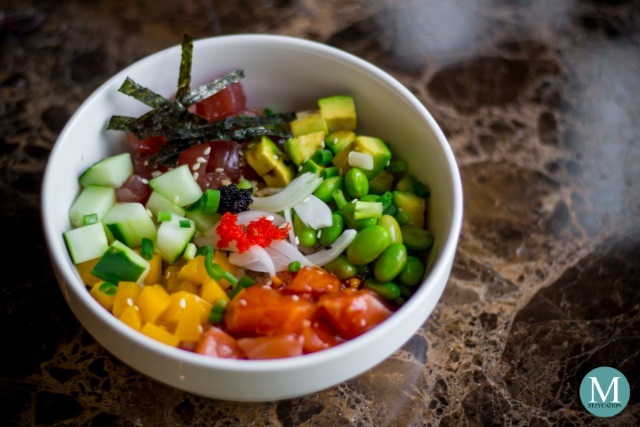 The key to a good poke bowl is a sashimi-grade fish such as tuna or salmon. Here at Flavors Restaurant, you assured that they only use sashimi-grade fish as these are the same fish they use in their Japanese Station. 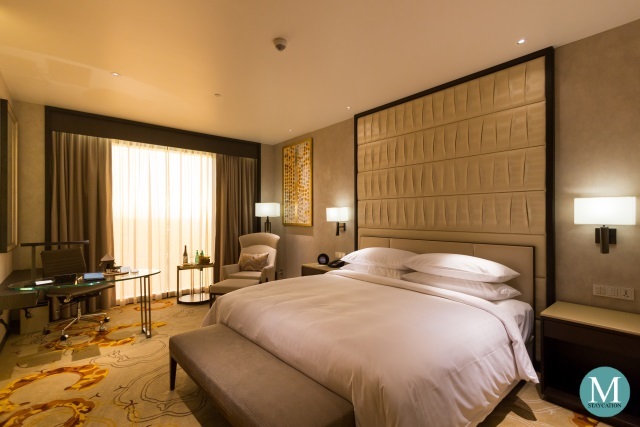 Tuna and salmon are kept chilled to maintain their freshness, and are only slice upon request from guests. Step 2 - Top you rice with vegetables or fruits. Step 3 - Have the chef slice tuna or salmon for you. You can have both if you wish. Step 4 - Choose your sauce. Step 2: I added a tablespoon of cubed cucumber, ripe mango, avocado, edamame, nori strips and sliced white onion. Make space for your fish. Step 3: I had both sliced tuna and salmon. Step 4: I drizzled the tuna with Ponzu Vinaigrette and the salmon with Spicy Sriracha Sauce. Finally, I sprinkled my bowl with sesame seeds and chopped scallions, adding black and orange tobiko. 1. Have the chef slice or cube a serving of salmon and place it in your bowl. 2. Add the sliced white onion, chopped scallions, tobiko and sesame seeds. 3. Add the Spicy Sriracha Mayonnaise, then mix everything in the bowl. 4. 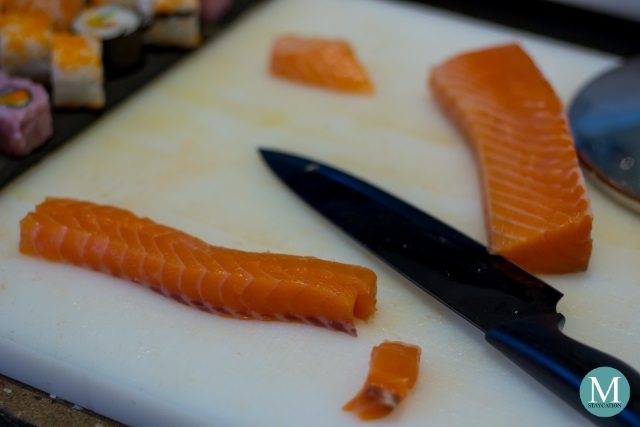 Let the salmon sit for five minutes, allowing the fish to absorb the flavors. 5. Get another bowl and layer the bottom with rice, about 1/3. 6. 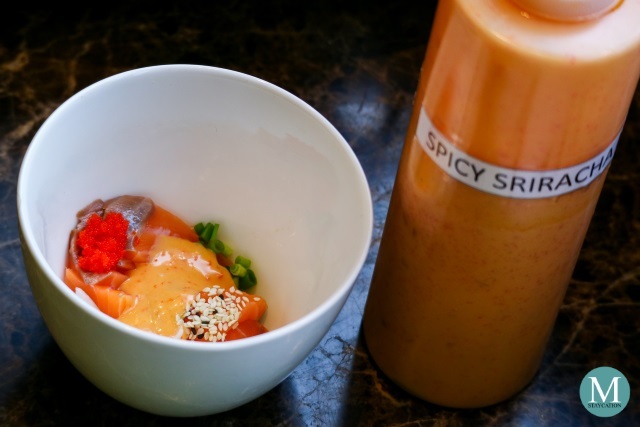 Give your salmon poke another mix, evenly coating the fish with the sauce. 7. Using chopsticks, transfer the poke onto the rice. 8. Leave the excess sauce in the bowl so not to soak the rice. 9. Add cubed cucumber and ripe mango onto the rice. 10. To garnish, add cilantro and sprinkle with sesame seeds and chopped scallions. 1. Have the chef slice or cube a serving of tuna and place it in your bowl. 3. Add the Ponzu Vinaigrette, then mix everything thoroughly. 4. Let the tuna sit for five minutes, allowing the fish to absorb the flavors. 6. 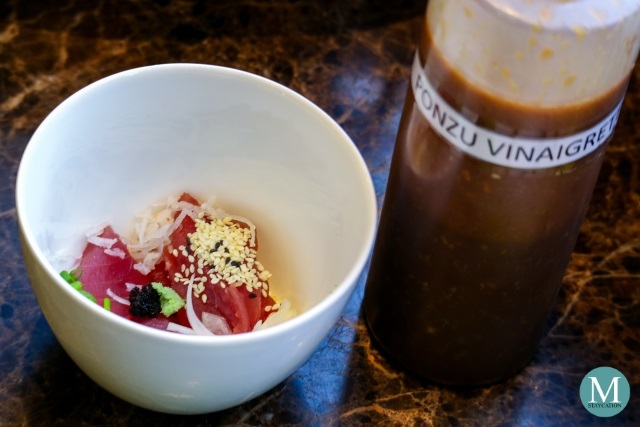 Give your tuna poke another mix, evenly coating the fish with the sauce. 9. Add cubed avocado and edamame onto the rice. 10. To garnish, add nori strips and sprinkle with sesame seeds and chopped scallions. 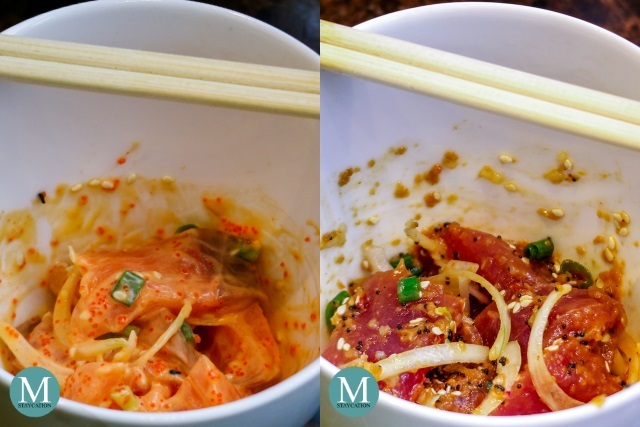 Below is my personalized Poke Bowl which include both the Spicy-Creamy Salmon Poke and the Traditional Hawaiian Tuna Poke. 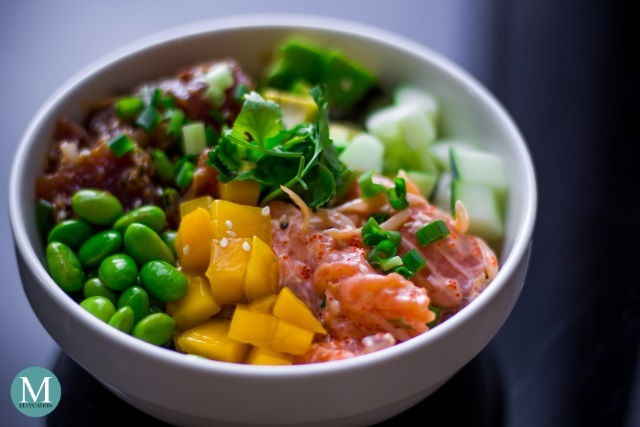 The cucumber and the edamame added crunchiness to the poke while the mango gave a contrasting sweet taste to the salmon. The avocado on the other hand added an exotic taste and creamy texture to the tuna. So if you feel like going for a Friday lunch out with your office mates, or a Friday weekend dinner with your friends, dine at Flavors Restaurant and try this very addicting yet healthy dish from Hawaii, and add some pinch of creativity and a dash adventure. 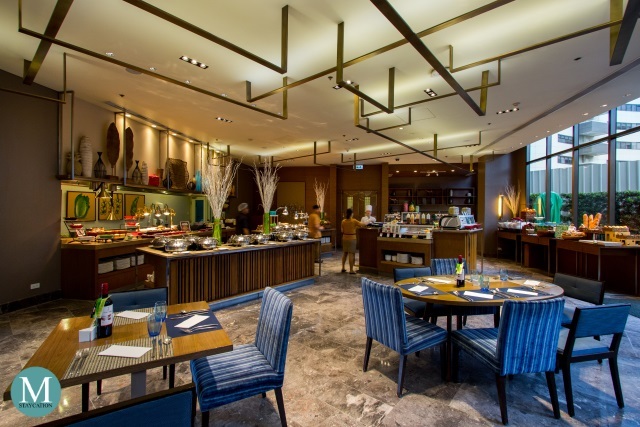 To book a table, you can call +63 (02) 909-0888 local 7429 or you can email them at hism.fb@ihg.com. 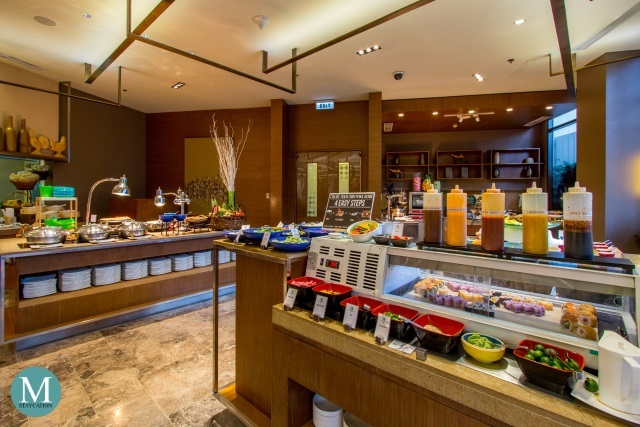 Aside from the Poke Bowl Station, the lunch and dinner buffets at Flavors Restaurant also has a Bread Station, a Salad Station, A Fresh Fruit Station. a Taco Station, a Carving Station, a Grilling Station, a Noodle Station, an extensive Mains Station, and a Dessert Station. Not to be missed are the Classic Crepe Samurai and the Ube Cheesecake! 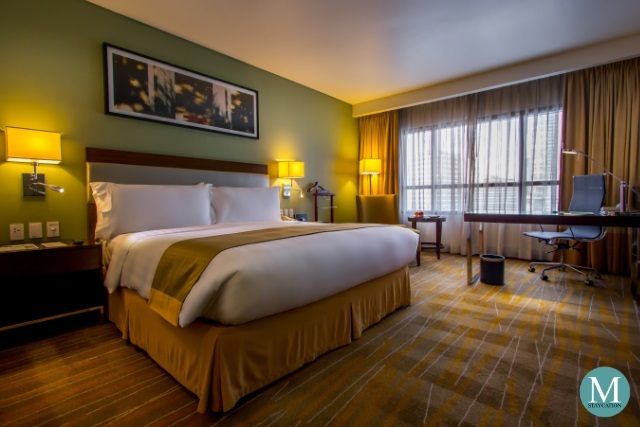 Why not schedule a Friday night staycation with your officemates, friends and family and book a room at Holiday Inn & Suites Makati (Check Room Rates). 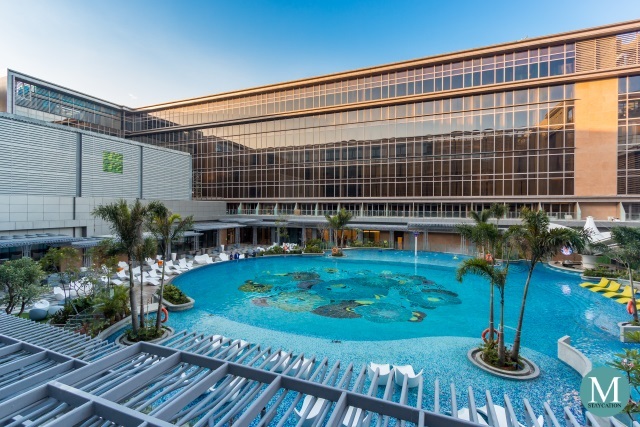 The hotel has 348 well-appointed guestrooms and suites, as well as an outdoor swimming pool, a fitness gym, a spa, a lobby lounge and a rooftop bar. 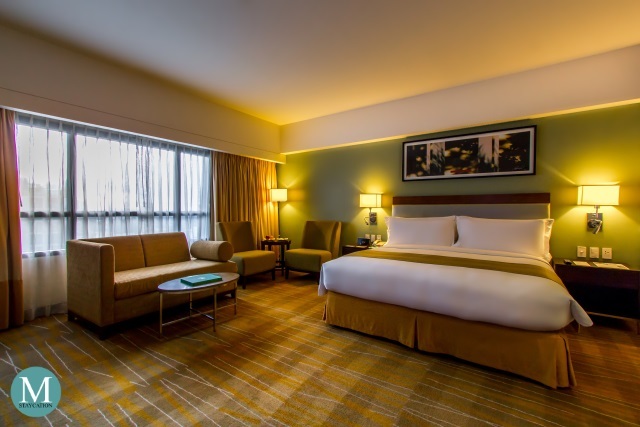 Holiday Inn & Suites Makati is conveniently located within Ayala Center and directly connects to Glorietta Mall. 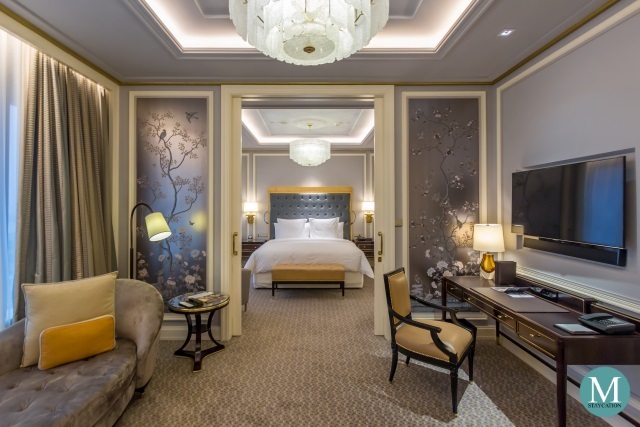 For small families, we recommend the 48 sqm Corner Suite (Check Room Availability) which has a lot of playing space for the kids and spacious enough to accommodate an extra bed.